I”ve been carrying a nappy bag for long enough to know that if anything that can be omitted, it’s going to do wonders for my shoulders. And while the Vapur drink bottle doesn’t exactly omit the need for a drink bottle, it does reduce space as it can be rolled, folded or flattened when empty – and easily tucked away! 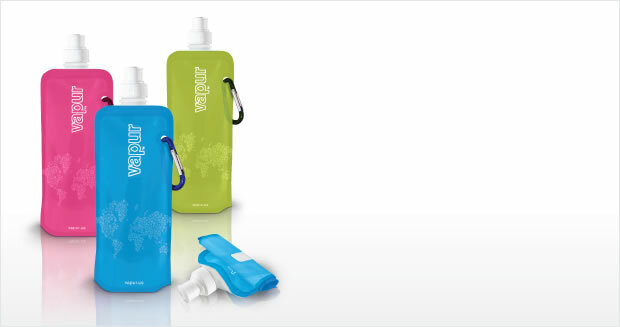 No more carrying around an awkward empty water bottle. I love this! Obviously it’s not rigid so you can fit it easily into most places, but it’s also reusable, attachable, freezable, identifiable, washable, and BPA-free – making this one of the handiest products I’ve seen for some time. Available in pink, blue or green, a Vapur can be yours for $US8.95, and a pack of four replacement sports caps will only set you back another $US2.95. Vapur does ship internationally, but you’re also welcome to buy them from Amazon.